A 250 mile stretch of the Sierra is impassable in winter. From Lake Isabella in the south to Carson Pass in the north, the roads that traverse the Sierras close. Sierra travellers from southern California must choose between going to the east or going to the west. Travellers from the Bay area have few options to get to the Eastside and northern Californians pretty much go around the range. This section concerns the western Sierra and southern Cascades. The west side of the Sierras is graced by Yosemite Valley, groves of giant Sequoias and approaches to the high alpine terrain that rise abruptly above the Eastside. The Southern Cascades are marked by the distinct volcanic cones of Lassen and Shasta. Three National Parks in this section provide skiers and snowshoers significant nonmotorized areas – which can otherwise be tough to find. North of Redding, the California national forests offer huge tracts of land, much of it suitable for winter recreation. Up highway 4, Bear Valley (at 7,000 feet elevation) offers 3,000 acres of groomed trails and nearby Bear Valley Village offers many options for ski-in, ski-out lodging (in particular if you don’t mind making your own trail). Within Yosemite, Badger Pass offers a variety of free groomed trails (and not-so groomed trails) at the start of the Glacier Point Road. Map. Here’s a description of the trail to Dewey Point. 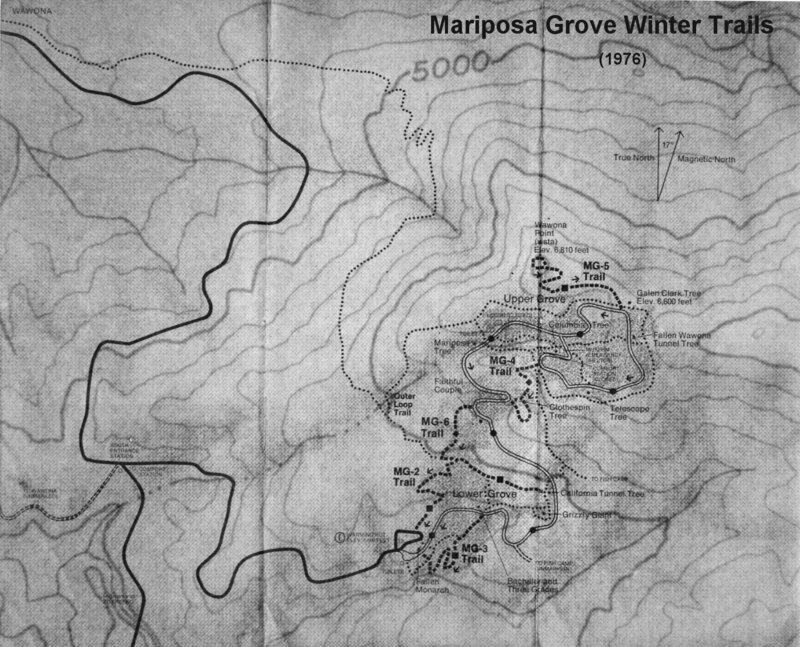 At Yosemite’s south entrance are groomed trails at the Mariposa redwood grove. Map. Sequoia and Kings Canyon National Parks offer ski trails through the giant sequoias and into the high alpine country from several locations off highways 180 and 108. The Shasta Nordic Center grooms 25 kilometers of trail on the lower slopes of Mt. Shasta. In Lassen National Forest, the trails at McGowan (off highway 89, south of Lassen National Park) are occasionally groomed. A group out of Chico posts maps of this and the Colby area on a yahoo forum. North of Lake Tahoe, Plumas-Eureka State Park offers groomed trails. Snowmobiles are prohibited in all California State Parks except motorized recreation areas. Depending on the snow elevation, there may also be skiing and snowshoeing opportunity off highway 4 among the majestic Giant Sequoia at Calaveras Big Trees State Park. Off highway 168 out of Fresno, Balsam and Coyote Sno-Parks are reserved for non-motorized recreation only. California Sno-Parks provides a full listing. Near Shasta, the Everett Memorial Highway provides access to Bunny Flat and other areas very popular for spring (and summer) skiing and ski-mountaineering. Lassen National Forest offers about a dozen designated ski trails spread around the forest, on which OSVs are prohibited (although the surrounding terrain is open to motorized use.) These include the McGowan and Colby areas (mentioned under Groomed Areas) and the Bizz Johnson trail west of Susanville, which follows an old railroad bed. The Eldorado National Forest provides a guide to ski trails in the Amador District west of Carson Pass. The Sierra National Forest offers a guide to ski trails in the Hume Lake District and the Kern Plateau in the far southern Sierra. Map. 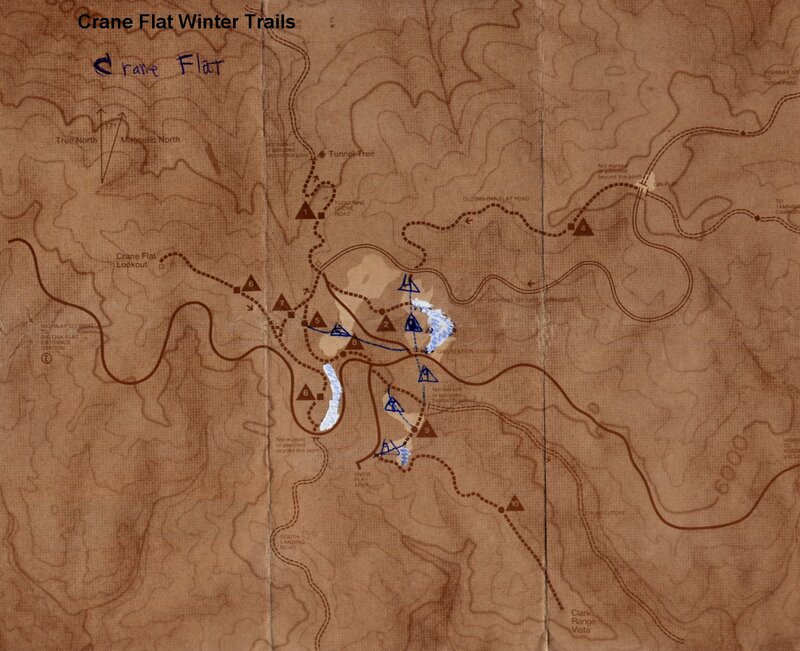 In Yosemite National Park, tracks or groomed trails might be found at the Crane Flat area at the north entrance . Map. The Bassett’s, Yuba and Gold Lake OSV trailheads north of Lake Tahoe provide winter access to the Sierra Buttes and lakes basin areas. The Lake Alpine OSV trailhead provides access to Ebbett’s Pass and the Highway 108 OSV trailhead provides access to Sonora Pass. The OSV Program trailheads in Sequoia National Monument offer additional touring opportunities. In the monument, snowmobiles are restricted to trail riding only, and some ski-only routes are offered. Map. Sierra National Forest provides a guide to cross country skiing from Sno-Parks and OSV trailheads. All of the lodging in Yosemite National Park and in Kings Canyon and Sequoia National Parks could be considered cross-country ski resorts. Opportunities range from the luxury of Yosemite’s Ahwahnee, to the Spartan John Muir Lodge in Kings Canyon and the rather chilly tent cabins at Curry Village (also in Yosemite – bring your insulating pad to put under the sheet). In between Kings Canyon and Sequoia National Parks, the Montecito- Sequoia Lodge offers full family plans and has groomed ski trails and ski programs. The Glacier Point Ski Hut is located at Glacier Point, above Half Dome and Yosemite falls, 10.5 mile ski in from Badger Pass ski area. ‘Nuff said. Bring or rent a sleeping bag and enjoy communal dinners and bunk room sleeping. It may seem more like a hut than a resort, but location, location, location! And there is a cook. In the Eldorado Forest northeast of Placerville, the Loon Lake Chalet can serve as a jumping off point to miles of backcountry touring. The Chalet holds up to 20 people and is rented for 24-hour periods. The Ostrander hut operated by the Yosemite Association, is an eight mile ski from Badger Pass ski resort, at the start of the Glacier Point road. As with many huts, it was built specifically for skiers. The Pear Lake Ski Hut in Sequoia National Park , operated by the Sequoia Natural History Association, offers advanced ski and snowshoe touring. Badger Pass offers a nordic and telemark skis for rent in addition to winter camping gear in conjunction with Yosemite Mountain School. Ebbetts Pass Sporting Goods, located in Arnold off of Hwy 4, rents cross country and nordic gear. Shasta Mountain Guides offers introductory trips, tours to the top and avalanche seminars. SWS Mountain Guides provides backcountry ski tours and mountaineering on Shasta and on the Eastside. Mountain Adventure Seminars offers backcountry ski tours and more, based out of Bear Valley. Call of the Wild Adventure Travel for Women offers trips for women into Sequoia and Yosemite National Parks. These experienced guides will teach the skills necessary for the best experience in the snow. Yosemite Cross Country Ski School leads guided tours into the Yosemite’s backcountry. Marcus Libkind provides an on-line guide to backcountry ski areas in the Sierra Nevada. Robin offers a fun guide to Mt. Shasta and offers guided backcountry day trips.